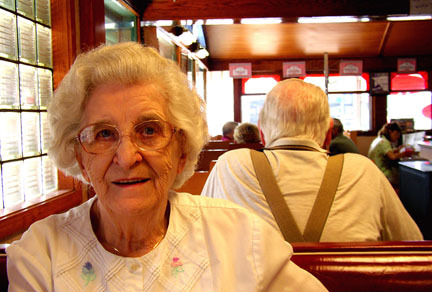 When was the last time you ate at your local restaurant? If it was in the past couple of months you are not alone. The National Restaurant Association recently announced that restaurants this spring have actually had their busiest season since September 2007. As more and more Americans decide to eat out it’s a clear sign that our economy has turned a corner. And when it comes to comfort your time-tested local diner is hard to beat– classic comfort food, classic atmosphere, and classic service. 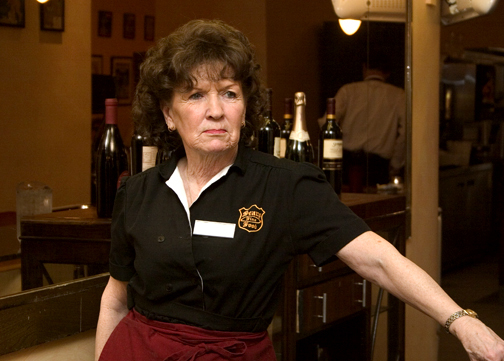 Service most likely from a seasoned waitress, who’s not afraid to tell you why the specials have been marked down. Take pride in your work. Love what you do. These are the basic ingredients to their success. Diner waitresses they take the job seriously. They care if your bacon is soggy or if your hash browns are overcooked. 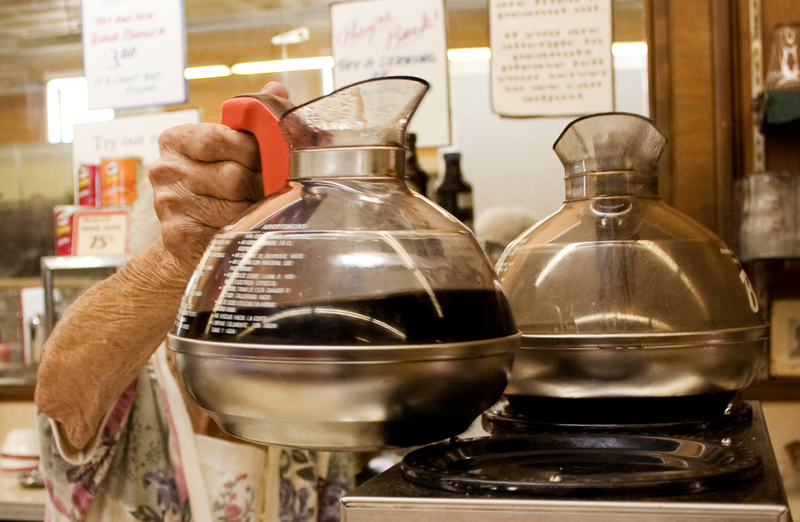 They warm the coffee cup for their favorite regulars and can always find a warm spot in their heart for strangers. They know the test results of their regulars’ last medical check up and they know if their kid graduated from school or spent the night in jail. They are not your average, everyday servers — they are the cream of the crop. 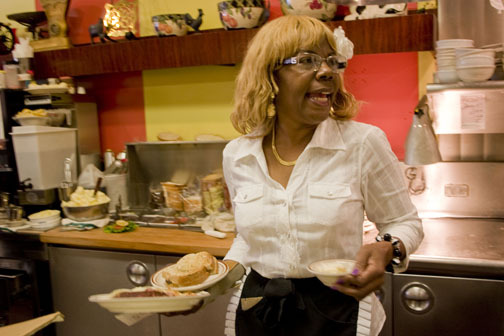 We assume that seasoned waitresses will always be there to dish out blue-plate specials and coffee warm-ups. But with economic realities causing managers to hire younger help, we shouldn’t take these women and the places they work for granted. The best way to keep these restaurants open is to become a regular. Go to your favorite diner, grab a stool and become a part of the counter culture. After all with May 21st being National Waitress Day make a point to see your favorite server and tell her how much you appreciate them. Bring a thoughtful gift like cushioned shoe inserts or a special pen and whatever you do, don’t forget to leave a good tip! I did a book signing in Santa Barbara today at Chaucer’s bookstore. It’s a fantastic bookstore that has been there for decades. There were about 25 people at the reading and Renee, the waitress who works at Harry’s in Santa Barbara, came along with her regulars. Renee and I both signed Counter Culture and everybody was so excited to see her. She was such a star. Counter Culture: The American Coffee Shop Waitress will be in bookstores on September 1st. I will be on book tour from September 3rd through November 18th. The tour starts in San Francisco at Modern Times – 888 Valencia St on September 3rd at 7pm. I was born and raised in Seligman. I’m Mexican. My mother was born here too and it was so neat because the house I was born in was a two-story house and they just, a few years ago – done away with it, and it was such a neat house. I started washing dishes when I was 10 and they put a crate on the floor for me to stand on. I used to love to go there. 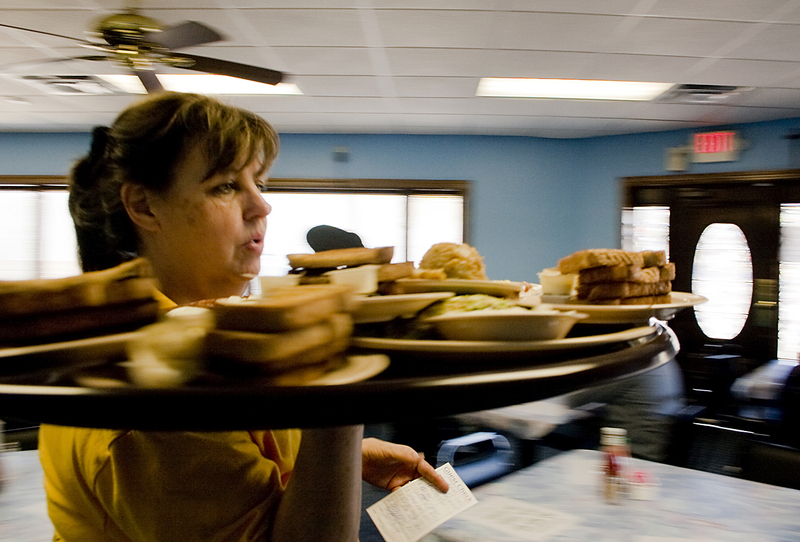 My first waitressing job [was] at 13, my x-brother-in-law was the one that broke me in. It was just a little old restaurant just across there, it used to be called the H&J. I was really shy then. I didn’t want to be around all the guys because they were all railroad guys. I worked at the Caverns, when old [Route] 66 was popular for Fred Harvey in the late 60’s. I was 21 years old. They had a write up in the paper with me and Fern (her sister) about the Fred Harvey Girls. Me and Fern and my older sister Josie all worked there at the Fred Harvey restaurant and we had to wear the uniforms. They were black dresses with the white pinafores. Oh I hated them things! We had to wear dresses, we couldn’t wear pants. You had to wear your hair down. If you had long hair you had to wear your hair in nets. I remember when I just started working for Buster Collins, he was from Arkansas and that guy was strict. We had to serve our coffee with saucers and if you spilled a little bit of coffee, he would call me back there and you had to re-serve again. He was real strict. But at the Caverns we had to wear the uniforms. You couldn’t chew gum, and there was no smoking either. You had to be real neat and you had wear a starched uniform everyday. Everyday. 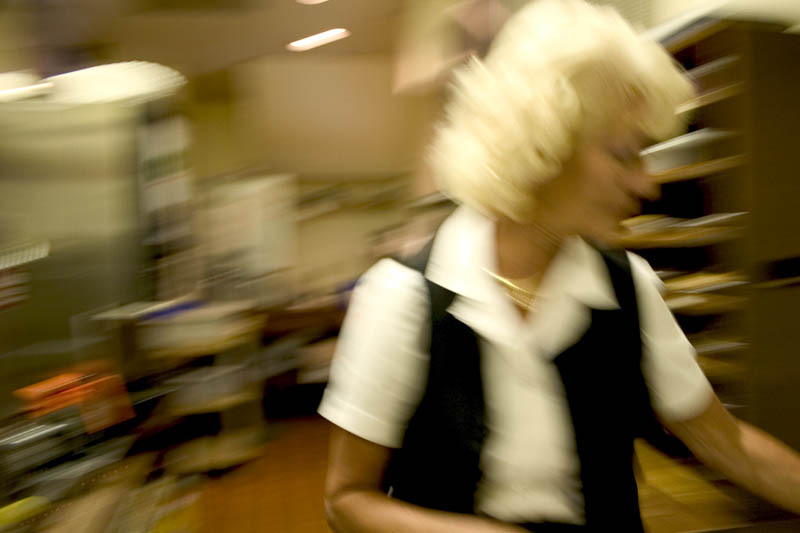 A lot of people say it’s [waitressing] stressful and if people give them a hard time, they can’t take it. They can’t do it. You have to put up with a lot sometimes. And you think, well people are tired and they’re going to be like that. I’ve gone through a lot of bad experiences but I’ve also had people send my gifts from different countries, from Germany, Taiwan. I get to talking with them, like one day this guy came in from Los Angeles, he was really, really nice. And few days later in the mail, he sent me a little gold metal. He was wearing a religious metal and I said, “Oh your metal’s so pretty.” Things like that. You get postcards from people that you’ve met. Some people from Taiwan, they came in here, there were three of them, they were having lunch. They asked for a plate and they poured this stuff onto the plate, it looked like strips of squash and tomatoes and it looked so good. I asked them what they were eating and they told me what it was. They said “Would you like a taste?” I said “Sure,” there were vegetables and I said “That is so good” and when they left they asked me for my address and I never thought anymore about it. Well like a few months later I get this box in the mail and it was from Taiwan. I still have some at home. They sent me packages of different types of vegetables with the hot sauce that they use and my husband and I were looking at it and it took about 3 months for that package to get here. It passed inspection and everything. I thought that was really neat. And then I had some German people here, they had two kids and they had their comics. We were talking at the table and it had the Disney characters in German. I said “Oh that it so cute, can you read to me in German?” Then they too asked me for my address and I got this package from the mail with the comics from Germany. You know the most I’ve ever made here was $350.00. It was the “Fun Run” and we were the only restaurant open. Lilos was remodeling. I would go home with over $200 everyday. Maybe it was more that I made. I really cleaned up. Don’t let the economy derail your dreams! For the first time in decades, stories about race, gender and class are daily topics in the news. Learn how to access this ready-made audience and to create innovative projects that sell. Students are invited to bring a project, at any stage, to discuss how to move their work forward. The waitress’ ear-piercing twang, mixed with the reverberating ring of the kitchen’s bell, creates the atmosphere that diners have marketed for decades. Grease carries the burnt smell of the range, while the aroma of frying bacon permeates the senses. You know breakfast is cooking when you hear the hollow crash of the frying pan hit the grill. The smells of bacon grease, watered down coffee, mixed with blueberry pancakes, curdled fat, and fried starch drift in the air. It’s not just the odors that make up the atmosphere of the diner but also the cacophony of clanging silverware against thick glass cream-colored plates laid over the chatter of patrons – all mixed up like a syncopated jazz riff. This environment with legs, mouths, arms, eyes, hands, and the silent breeze of the waitress rushing by; stirs up to a breakneck pace in a centrifugal spin. All managed and controlled by the well-seasoned waitress who race to our tables, quarrel with the cooks and bring humor and culture to the American roadside dining experience. Nevada was unlike any other state I visited in terms of the benefits that waitresses received. Virginia Brandon moved to Nevada from California because of the benefits Nevada offered to restaurant workers. “The union makes a big difference.” says Susan Thurmond, Virginia’s daughter, who worked with her mom at the Rainbow in Henderson, Nevada. She continues, “We get retirement benefits, maternity leave, health insurance….we get it all. We had to fight for it though.” Even if a waitress doesn’t work in a union house, the union is so strong in Nevada that non-union restaurants still have to offer health insurance and retirement benefits to attract workers.